Acupressure Points: Thinking outside the species box! This little lamb was seen by a local veterinarian for a dislocated hock. 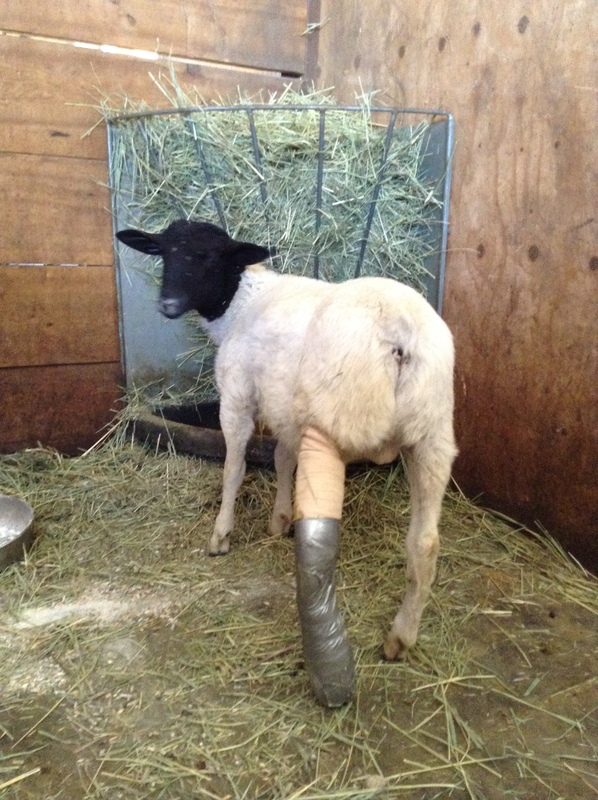 The veterinarian then re-located and set a cast for the hock. The April 2015 Large and Small Animal Acupressure class was able to learn firsthand that LI 4 is not only for pain in horses and dogs, but other animals too! 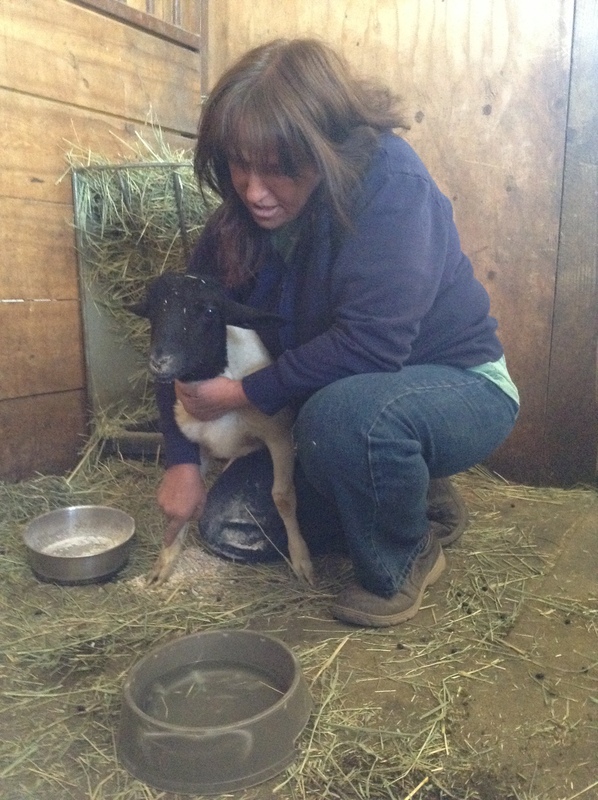 When the veterinarian cleared the lamb for other treatment modalities, the class was able to see a demonstration of acupressure points on the little guy. For more information on acupressure classes, visit http://www.rmsaam.com or email information@rmsaam.com for more details. Spring is Here, Stop Hibernating, and let’s not get Angry! Spring is a happy time. The spring grass is emerging, and the animals love the return of longer days of sunshine, and warmth of the Spring air. In TCM, spring is represented by the element Wood. Wood represents birth and newness. Wood governs the spine, joints, muscles, ligaments and tendons, and the eyes. A Wood energy imbalance can lead to spinal problems, poor flexibility, arthritis and eye problems. The Wood element governs the liver. The Liver meridian is responsible for the smooth flow of Qi , and smooth flowing Qi means balanced health, vitality, and balanced emotions. The emotion associated with the liver, and the wind of spring, is Anger. If your animal’s liver energy is imbalanced their Qi will be disrupted and they can become irritable, and even angry. Spring into action and perform acupressure to balance the Wood element, and balance the liver. Spring into action, and give your animals and your clients animals a Spring Acupressure Session. Massage the following points clockwise with your thumb, for thirty seconds on the right of side of the animal, and then do the same on the left. Liv3 , the Source Point of the Liver Meridian, to promote the smooth flow of Qi, and balance the emotions. LI11, to help support the immune system. Extremely, helpful for animals with allergies. Caution Spring is also when many of our animals are pregnant, remember DO NOT perform acupressure on pregnant animals!!!! In addition, this is the time to increase your animal’s activity. You animals need to come out of hibernation. Walk you dogs more often. If your horses have been off work all winter, start doing your ground work, and light riding. The increase in activity will be helpful for them, and you! What’s all the bleating about? Goats make a noise that sounds like ‘Baaaaa’ and it is described as a bleat. RMSAAM Large and Small Animal Acupressure Class perform acupressure on horses and dogs and Goats. Did you know the basic function and energetic application of acupressure points are the same for humans, horses, dogs, goats, pigs, rabbits, and all animals? If you know the function and energetic acupressure point you can transpose the point location and use the point for Goats. Goats have Association Points, Master Points, Alarm Points, and Ting Points; just like all other animals. Sometimes their friends will be so jealous they will even pretend they are a goat. If you learn how to determine what points to use to help Large and Small Animals, you can help Goats using acupressure points. Sometimes they will wait for you to determine which points to use and sometimes they will try to help! But in the end remember if you learn a point such as ST36, is the Master Point for the Gastrointestinal System, you can use ST36 on a Goat to help maintain his or her GI system. So that’s what all the bleating is about! To learn more about RMSAAM’s Large and Small Animal Acupressure Courses, see our class listings. Give your dog a “Protective Metal Coat” for winter! Give Your Dog a Powerful Acupressure Treatment to Boost Their “Protective Metal” in preparation for winter. Master Points are Powerful Acupressure Points used to balance energy and resolve many physical and emotional issues. There are 6 Master Points. 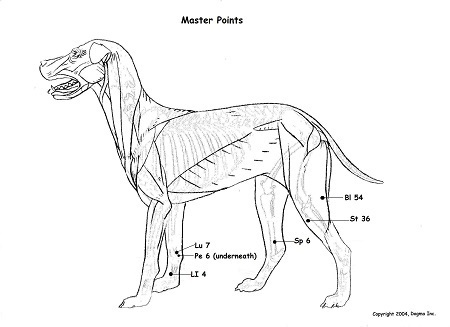 Master Points are often used to affect specific anatomical regions on the animal’s body. These points are located near the carpals on the forelegs and near the stifle on the hind legs. until the dog has a release of energy*, such as licking, yawning, barking, stretching or moving away from touch. NEXT: Repeat on Left side of dog. Next- Tonify Lu 7 with your thumb, by rubbing the point gently clockwise on the right side of the dog until the dog has a release of energy. Next- Tonify ST36 with your thumb, by rubbing the point gently clockwise on the right side of the dog until the dog has a release of energy. *Note if the dog does not have an obvious release of energy, stimulate the point for 30 seconds, and move to the next point. *You can also use the same Master Point treatment on your horse. Learn more about these, and other powerful acupressure point groups, in RMSAAM’s Animal Acupressure Courses.